To me, this is the blueberry muffin recipe to end all blueberry muffin recipes. 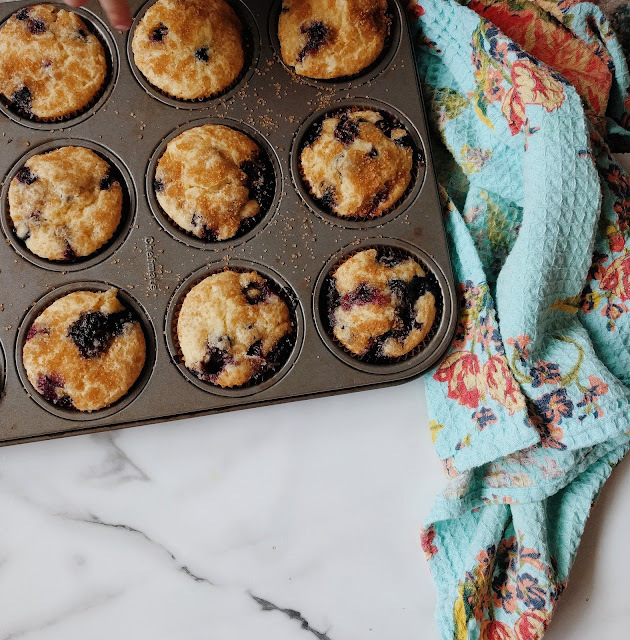 The ingredients are easy, (and besides the blueberries) I almost always have them on hand. The batter is delicious and thick. Once the muffins bake, they're moist and flavorful. And the crunchy sugar on top makes them restaurant quality without being overly sweet. Preheat oven to 350 degrees. Line a muffin tin with paper liners. In a medium bowl, whisk together flour, baking powder, and salt, and set aside. Cream the butter and sugar together until light and fluffy. Add in the eggs, vanilla, and milk. Sprinkle each muffin with about a teaspoon of raw turbinado sugar. Put in the oven and bake for 20-25 minutes.